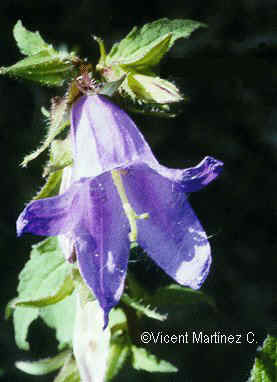 Photo of Campanula trachelium L.
Perennial herb of the bellflower family -campanulaceae– till 1 m. tall. Rough angled stems. Basal leaves till 10 cm long, ovate-triangular with long stalks.Stem leaves with shorter stems and narrower. Bell- shaped blue flowers in long heads, in groups of 2 or 4 with hairy calyx. In woods and humid hedges.